William Gaspard is from the Louisiana School for the Agricultural Sciences FFA Chapter where he currently serves as the chapter president. He has been in FFA since the seventh grade and has experienced and witnessed the true impact FFA can have on its members. In addition to this, he currently serves as his school’s Beta Club president, Student Council president, and Director of Development of his own non-profit, Truly Thrive. In his spare time, he enjoys singing, dancing, marketing and digital designing, as well as cooking and experimenting in the kitchen. He plans to attend Louisiana State University in the fall of 2019 to attain a degree in agricultural economics and business and continue to pursue a law degree focusing on public policy and laws affecting the agricultural community. His philosophy of life is: “It’s no use going back to yesterday because I was a different person then.” We are given the opportunity to know and grow each and every day. As a state officer, it’s his primary goal to be a catalyst to assist members in growing, learning, and helping them reach their pinnacle of leadership and true service. He cannot wait to see what we as an organization will accomplish this year. 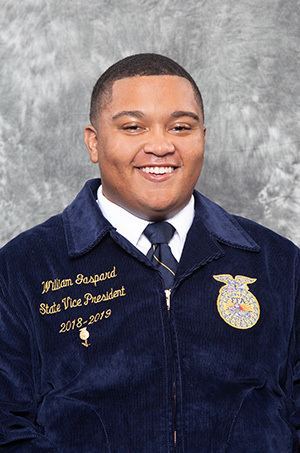 William Gaspard is proud to serve as our 2018-2019 State FFA Vice President representing Area III.